On May 14, 1991 the oppressed people of the world lost a great leader. The news of Chiang Ching's death saddened the hearts of revolutionaries around the world, and those who had been inspired by Mao Tsetung and the Cultural Revolution in China felt a deep loss. But the powers have kept the significance of Chiang Ching's life and death from the broad masses of people. And there are many who do not know anything about Chiang Ching but the lies and slander run out in the mainstream press. The powers clearly hate everything Chiang Ching stood for. But this should make the oppressed want to know about her even more. The people need to know about Chiang Ching because she was truly one of the great revolutionary leaders of our time. And she leaves behind a spirit and legacy that should be cherished by all people who dream of a world free from exploitation and oppression. Chiang Ching's whole life was dedicated to those on the bottom of society. The oppressed masses of workers and peasants who dared to challenge tradition's chains. Who dared -- not only to seize power in China, but move on to revolutionize all of society, from top to bottom. Chiang Ching was born in Shantung Province, East China, in 1914 and joined the Communist Party in 1933 in her late teens. The party sent her to Shanghai where she became a stage and film actress and she worked with the Shanghai Work Study Troupe and taught at a workers' night school. But Chiang wanted to develop cultural works more closely linked with the revolutionary struggle. And so after a few years in Shanghai she asked to be sent to Yenan -- the revolutionary base area that had been established under the leadership of Mao Tsetung. She arrived in Yenan in 1937 and worked with the Yenan Documentary Film Unit, and it was here that Chiang Ching and Mao Tsetung met. For the next 40 years they would be close comrades in arms, united by their common hatred of the enemy and love for the people. Mao was intensely interested in plays, concerts, poetry and art. And he admired women artists and actresses who had emancipated themselves. He knew they had to struggle against traditional views that treated actresses as women of ``ill repute.'' And he united with their recognition of the important role of art and literature in molding public opinion. Mao's line was that art should serve the revolutionary cause. And it was on this common ground of art to serve the people that Mao and Chiang Ching met and fell in love. Their marriage gave Mao great happiness and a deeper understanding of the problems of art and literature. And Chiang Ching was to influence him in this sphere throughout his life. Some of Mao's enemies inside the party opposed Chiang Ching and her marriage to Mao from the very beginning. But Mao and Chiang were determined to get married and the Political Bureau of the party finally gave grudging consent -- but only on the outrageous condition that Chiang not be given any position in the party and be kept out of politics. Even within the revolutionary ranks there were men who held to feudal ideas and were appalled at the idea of a strong revolutionary woman. And from this time on, Chiang had to fight to be recognized as a leader in her own right. She became the repeated target of vicious gossip. And many times when Mao's enemies wanted to attack him but were afraid to do so openly, they would start some kind of vicious rumor about her. In 1949 China was liberated. Power was put into the hands of the revolutionary proletariat and the masses of people began to build a whole new society. This was a socialist society with the goal of eliminating all oppression and inequality. A society where millions of people were mobilized to participate in transforming every sphere of life -- from economics and politics to philosophy and culture. And as all of society was turned upside down and radically transformed, so too did the struggle for women's liberation move forward. For the first time, women in China were given equal rights. The brutal practice of arranged marriages was outlawed and women were given the right to divorce. Men were no longer allowed to treat their wives as household slaves. And women were encouraged to step forward and join the struggle to build a new society. This most radical and earthshaking movement produced and brought forward many women revolutionary leaders. And it was exactly this process that brought Chiang Ching to the fore as a great revolutionary leader. In the 1960s Chiang Ching spent long periods in Shanghai, recovering from serious health problems. During this time she attended plays, saw films and other artistic productions. And what she discovered shocked and disturbed her. Many of the cultural works she observed were in direct contradiction to the goals of socialist society. What she saw in the main was a ``theater of the dead'' -- a culture promoting old ideas, practices and habits of the exploiting classes. A stage dominated by forces in society opposed to the elimination of privilege and inequality. Chiang Ching gave voice to a new generation of theater-goers and actors who made urgent demands on the arts. A whole new consciousness was developing among the people and they wanted plays, ballets, music and other artistic works that reflected the new society. They wanted cultural works that exposed the old society they had fought so hard to overthrow. And they wanted a culture that would support and push forward the continuing struggle to radically transform society -- not stand in the way. Chiang Ching united with this sentiment and was instrumental in developing a new revolutionary culture that was widely taken up by the masses. From Peking to Shanghai, she stirred up trouble and earned the hatred of the conservative forces who headed up the party's cultural work. Throughout the 1950s Chiang had been investigating and studying the art and literature scene. So by the 1960s she was ready to blast out with full force against revisionists like Chou Yang, head of the Ministry of Culture, who stubbornly opposed staging operas with revolutionary themes. Chiang actively led and sparked this struggle. She visited artists, actors and musicians, encouraging them to carry out Mao's line on literature and art. She went boldly into the theaters and ballet troupes, speaking directly to performers. And she did this over the heads of their superiors, inciting them to criticize ``bourgeois art'' and those party leaders who promoted it. In the China Peking Opera Theater and the Peking Opera Theater of Shanghai, in the ballet schools in Peking and Shanghai, and elsewhere she encouraged talented young artists to go up against tired, conservative leaders and stage new productions. There were many times when Chiang Ching had to ``go against the tide.'' Her work was sabotaged, she was personally attacked and slandered. And there were times when she and Mao's other close comrades were clearly in the minority. 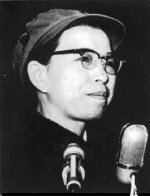 But Chiang Ching had great faith in the masses and she relied on them to wage the struggle for a new revolutionary culture. In developing a method for creating good, modern plays, she was the first to suggest the ``three-in-one combination.'' What she developed were leading groups made up of three components: leadership cadres, playwrights and the masses. The leadership would first set the theme and the playwrights would then consider it and go out to gain experience of that subject in real life. When the play was written, the masses, who knew about the play's theme from actual experience, would review, discuss and give opinions on it. Model works were developed in this way, like the famous ``Red Detachment of Women.'' And they were then performed not only by big professional companies, but by all kinds of smaller amateur groups in the cities and countryside. This whole ``three-in-one'' method was later used as a model for the Revolutionary Committee -- the new form of leadership organization developed during the Cultural Revolution. One of the things Chiang Ching is best known for is her role in creating a new revolutionary Peking Opera. This was one of the earliest victories of the Cultural Revolution -- an opening shot in a struggle that pitted Mao's supporters against the ``capitalist roaders'' in the party who wanted to bring back capitalism. The stakes of this battle were great. Chiang Ching knew that if Mao's enemies were able to maintain control of the propaganda and cultural departments this would give them a lot of power to promote their ideas and rally forces to their side. If ``emperors and princes'' were allowed to dominate the culture, this would eventually undermine the social and economic structure of socialist society. Peking opera had its roots in centuries-old folk art, but it was a product of feudalism and reflected an elite class in society. Even under socialism this art form had been resistant to change. What distinguished Chiang's revolutionary model operas was that these plays took up topical political themes in modern dress, even though they used many of the artistic elements of classic opera. In developing the Peking Opera Chiang Ching found ways to give the traditional music more strength and power. Western instruments were added, including a full range of wind instruments, along with the kettle drum, the piano and the harp. And this gave the music a greater capacity to express the full range of human emotions. The prominent characters in these works were the masses of people and revolutionary heros and heroines. All this was an example of integrating the rich cultural heritage of China into new socialist art. As Mao had said in 1963, ``Operas should develop what is new from what is old, rather than what is old from what is old.'' High party officials in charge of culture tried to block these efforts by Chiang Ching. They rejected the work of young workers and peasants, claiming they were ``technically inferior'' or ``unknowns.'' New productions were harassed and sabotaged. There would be no vacant theaters, no place to rehearse, and no publicity. And there were repeated attempts to silence Chiang Ching's leadership. For instance, at an opera festival in the fall of 1964 Chiang Ching delivered a major speech on the revolution of the Peking Opera. But this speech went unreported until three years later, in 1967. The intense struggle in the cultural realm tested and trained Chiang Ching for even bigger battles. The question was up: would the proletariat hold on to state power or would power be grabbed by those in the party who wanted to take China down the capitalist road? Mao understood this problem could not be solved by just kicking out a few enemies in the party. And he called on the masses in their millions to take up this struggle. In the midst of this unprecedented upsurge Chiang Ching came forward as a leader in an all-around way. Chiang Ching helped deliver what Mao called ``the signal'' for the beginning of the Cultural Revolution. Under Mao and her leadership an article was written criticizing the play ``Hai Jui Dismissed from Office,'' which was a thinly disguised attack on the revolution. And it was this article that sounded the call for the masses to expose and kick out those in the party taking the capitalist road. Chiang Ching was also instrumental in writing the May 16th Circular -- a very important statement of principles which set out the goals and methods for the Cultural Revolution. On May 25, 1966, students at Peking University put up a big character poster criticizing the head of the university and other high-ranking party officials. Mao supported this and asked that this ``first Marxist-Leninist big character poster'' be broadcast on the radio and printed in the newspapers. Mass struggle broke out on campus and quickly spread to other schools. Chiang Ching recognized the significance of this upsurge and decided to go to Peking University. She wanted to talk to the students herself and investigate the situation firsthand. What she found was that the party ``work teams'' that had been sent from Peking to ``guide'' the struggle were really trying to put down and derail the rebel students. Chiang Ching became identified with the youth and enjoyed enormous prestige among them. When the Red Guards first appeared she defended and encouraged them. She was appointed First Deputy Head of the Cultural Revolution Group, the group of party leaders entrusted with the task of leading the Cultural Revolution. And in this capacity she attended seven of the eight mass Red Guard rallies in Peking. Later an ultra-left line developed among the students that threatened to sabotage Mao's line by advocating the use of violence to resolve differences among the people. And Chiang Ching played a key role in combating this trend. She told the students, ``Don't hit others and beat them. Struggle by force can only touch the skin and flesh, while the struggle by reasoning things out can touch them to their very souls.'' Chiang Ching also assisted and gave support to the workers when they seized power from party leaders who had been exposed as ``capitalist roaders.'' She encouraged workers in the takeover of the Trade Union Federation in December 1966, one of the first of these power seizures. As the Cultural Revolution deepened, right-wing forces in the party continued to oppose the revolutionary changes being made in the economy, health, education and culture. Chiang Ching played a leading role in mobilizing the masses to combat these efforts to put so-called experts back in command and undercut the new socialist ways of doing things. And when people like Deng Xiaoping promoted the idea that China should open its doors to Western capitalism, Chiang Ching helped to expose and oppose this plan to sell out China's soul. While providing overall leadership to the Cultural Revolution, Chiang Ching continued to play a key role in the struggle to develop revolutionary culture. In November 1966 she became the cultural adviser to the People's Liberation Army and called on the masses of soldiers to take up pen, paint, baton and camera and join the struggle to develop art to serve the people. In 1976, as Mao's enemies moved in to stage a military takeover, Chiang Ching, along with Chang Chun-chiao and others, organized heroic last-ditch efforts to save the revolution. With Chiang Ching's death the oppressors still slander and lie about her life. They know what it means for the oppressed to have a leader like her. They know that the lessons from her life are a powerful weapon for all those who want to overthrow the powers and build a whole new society. Chiang Ching always kept her sights on the goal of world revolution, and her faith in the masses gave her revolutionary strength and optimism to carry her through tumultuous and dangerous times. She was willing to risk all to win all. And she was willing to make the ultimate sacrifice. For all this the defenders of oppression hate Chiang Ching and will never stop using their weapons of lie and deceit to try and bury her life. But this cannot be allowed! It is up to the people to teach the real story of Chiang Ching. It is up to us to cherish her memory and carry on in the revolutionary cause for which she lived and died.